Essaouira, 모로코의 리아드 다르 아프람 | 호스텔월드에서 예약하세요. 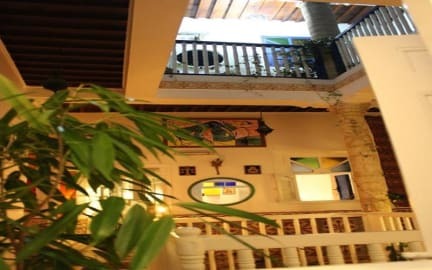 Dar Afram is a beautiful, traditional hostel located in Essaouira. Dar Afram is famous for music, a funky vibe and a special, unique atmosphere. It is the best way to discover the true spirit of Morocco and to live an unforgettable experience. The Riad has been totally renovated and decorated but maintains the traditional style of a Moroccan Riad. You can enjoy a fantastic 360 degrees view of the sea and see far across the roofs of the medina. Alongside the main lounge room is the dining room. Breakfast and dinner are provided to all guests, although the evening meal is entirely optional. The food served is always a selection of the finest Moroccan delicacies. 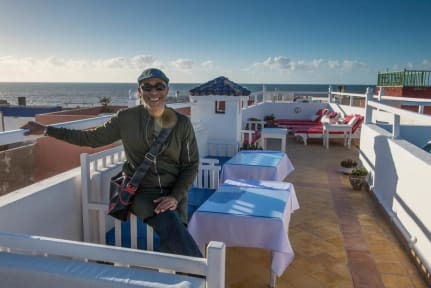 On one of their two sunny terraces there is a traditional Moroccan barbecue where you can indulge in rooftop meals as you watch the sunset or gaze into the moon light. Communal evening meals are organised every night with some of the town finest chefs and live music follows. Musicians and artists from all over the world visit Dar Afram. A house of charm, inspiration and good feeling which is beautifully decorated with various art and antiques. Our guests often stay longer than expected and truly feel at home. For your information, the property can organize day trips, desert tours, surf and kitesurf lessons, camel and horse riding, quad biking, Hamman and many activities as desired. Dar Afram is a traditional Riad located in the heart of the ancient Medina in the beautiful coastal town of Essaouira. A cute, clean street just around the corner from the Skala, the famous ocean lookout. 2 minutes’ walk to the big square, main street, restaurants and shops and 5 minutes’ walk to the beach. The property offers in total 6 high standard spotless rooms with private bathroom and showers, of which a family room and a mixed dorm. Check-in time is from 12 pm to 11 pm. No 24-hour front desk. Opening time is from 8 am to 11 pm. Payment types accepted at this property:only cash accepted.